- WWA Retribution (December 6, '02) = Legend fell to Mike Sanders. - WWA North Shore Events Centre Show (May 25, '03) = Legend lost to Sabu. - NWA-TNA PPV (Show #53, July 16, '03) = Legend beat Jeff Jarrett. - NWA-TNA PPV (Show #54, July 23, '03) = Legend won a "Handicap" Match over Matt Sydal & Altar Boy Luke. - NWA-TNA PPV (Show #55, July 3, '03) = Legend lost a "Guitar/Baseball Bat On A Pole" Match to Jeff Jarrett. - NWA-TNA PPV (Show #57, August 13, '03) = In a dark match, Legend & Christopher Daniels beat Shawn Daivari & Sean Casey. - NWA-TNA PPV (Show #58, August 20, '03) = Legend & Christopher Daniels fell to Erik Watts & Jeff Jarrett. Later on, Legend competed in a "Gauntlet" Match, which was won by Raven. - NWA-TNA PPV (Show #65, October 15, '03) = Joe Legend, Sonny Siaki & Ekmo lost to Dusty Rhodes & America's Most Wanted. - NWA-TNA PPV (Show #66, October 22, '03) = Legend, Sonny Siaki & Ekmo were beaten by 3 Live Cru. - NWA-TNA PPV (Show #69, November 12, '03) = In a dark match, Legend defeated Chris Hero. - NWA-TNA PPV (Show #70, November 19, '03) = Red Shirt Security (Legend, Kevin Northcutt & Ryan Wilson) fell to Erik Watts, Raven & the Sandman. - NWA-TNA PPV (Show #71, November 26, '03) = Legend was pinned by Raven. - NWA-TNA PPV (Show #72, December 3, '03) = Red Shirt Security (Legend & Kevin Northcutt) & Abyss beat Raven & the Gathering. - NWA-TNA PPV (Show #73, December 10, '03) = Red Shirt Security fell to the Gathering. - NWA-TNA PPV (Show #74, December 17, '03) = Red Shirt Security & Abyss won a "Steel Cage" Match over Raven & the Gathering. - NWA-TNA PPV (Show #75, January 7, '04) = Red Shirt Security & Abyss defeated AJ Styles & America's Most Wanted. - NWA-TNA PPV (Show #76, January 14, '04) = Red Shirt Security were beaten by America's Most Wanted. - NWA-TNA PPV (Show #77, January 21, '04) = Red Shirt Security took down America's Most Wanted. - NWA-TNA PPV (Show #78, January 28, '04) = Red Shirt Security won the NWA World Tag Titles, beating 3 Live Cru (Killings & James). - IWC Hopewell Havoc (January 31, '04) = Legend lost a "Three Way" Match to Chris Sabin. Jimmy Jacobs was the other participant. - NWA-TNA PPV (Show #79, February 4, '04) = Red Shirt Security lost the NWA World Tag belts in a "Handicap" Match to AJ Styles. - NWA-TNA PPV (Show #81, February 18, '04) = Red Shirt Security was beaten by Dustin Rhodes & El Leon. 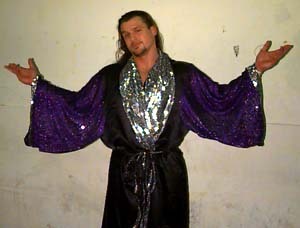 - IWC Showdown In Turkey Town I (March 6, '04) = Legend fell to Jimmy Vegas. - NOAH Budokan Hall (September 9, '06) = Legend, Scorpio, & Ace Steel defeated Akitoshi Saito, Masao Inoue, & Kishin Kawabata. - NOAH Budokan Hall (April 28, '07) = Legend, Kishin Kawabata, & Kentaro Shiga beat Akira Taue, Yoshinobu Kanemaru, & Shuhei Taniguchi.